Blood Orange is the electrifying debut thriller from Harriet Tyce. Utterly addictive it explores the power of desire, jealousy and betrayal. Full of dark drama and unexpected twists, The Night She Died is the latest psychological thriller from bestselling Shrewsbury based author Jenny Blackhurst. 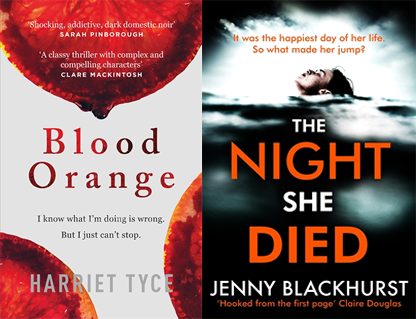 If you love dark, domestic noir with sharp prose, compelling characters and gloriously twisted plots then both these books are for you. Come and meet Harriet and Jenny, hear how they started their writing careers, trade stories of their craft and discuss how they create those gripping storylines. Harriet & Jenny will be interviewed by fellow author Adam Hamdy. Tickets: £5 (redeemable against a signed copy of either author's book). Includes a glass of wine / soft drink on arrival. Tickets available from the bookshop, or purchase online (with booking fee).